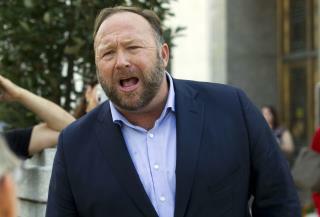 (Newser) – Twitter has again suspended Alex Jones of InfoWars infamy. And this time it's permanent, CNN reports. "We took this action based on new reports of tweets and videos posted yesterday that violate our abusive behavior police, in addition to the accounts' past violations," Twitter tweeted on Thursday afternoon; InfoWars is also permanently banned. CNBC notes that the ban is related to a confrontation between Jones and a CNN reporter at Capitol Hill on Wednesday that was streamed live on Twitter's Periscope service. Pic of bozo Jones tells it all - there is a pain in his caboose. Ouch! Good riddance to that vile filth Jones and his HateWars nonsense on Twitter.